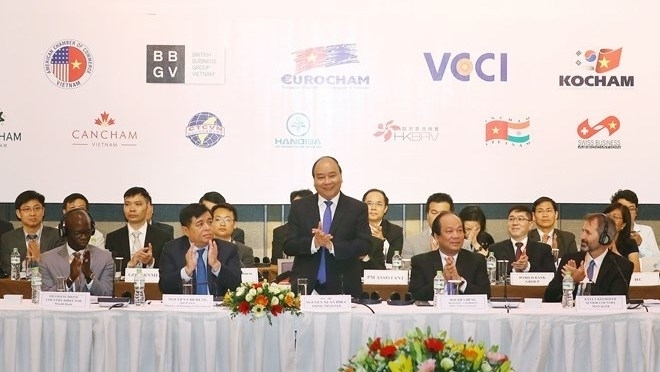 The entrepreneurial spirit of businesses is a stimulus for the Government to act more drastically and innovatively, said Prime Minister Nguyen Xuan Phuc at the annual Vietnam Business Forum (VBF) 2018, which kicked off in Hanoi on December 4, under the theme “Sharing opportunities in the world of changing trade”. The PM highlighted the forum as an important dialogue channel between the Government and the business community. He noted all of the constructive opinions from enterprises and appreciated their enthusiasm and aspirations to make more contributions to the country’s development. The Government leader expressed his belief that businesses can find a lot of cooperation opportunities despite strong impacts from the global trade issues. He underlined Vietnam’s significant economic accomplishments over the recent years, noting that national economic growth is projected at 7% in 2018, the highest level over the past decade and much higher than that of other countries in the region. Along with the achievements, Vietnam has become a “big workshop” of the world and a “fulcrum” for many transnational corporations providing competitive products and services in the region and around the globe, he said. The presence of leading groups in Vietnam, such as Samsung, Intel, Canon, Fujitsu, Toyota, Honda, Nike, and Vinacapital, as well as thousands of foreign direct investment (FDI) enterprises, is a guarantee of the quality of the investment environment and growth prospects of Vietnam, he said. The strong growth of private economic groups indicates that the business climate in Vietnam could give birth to large internationally competitive enterprises, the PM added. 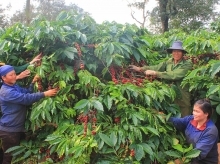 Vietnam now has more than 20 export items worth over US$1 billion, he said, adding that agricultural products such as rice, pepper, coffee, and basa fish are leading the global market. Fruits such as dragon fruit, mango, longan, lychee, rambutan, and grapefruit are exported to such fastidious markets as the US, Europe, Japan, the Republic of Korea, and Australia. The PM emphasised the country’s consistency in trade liberalisation and economic integration with the signing of and negotiations on 16 free trade agreements (FTA), which will enable Vietnam to access more than 60 economies, including 15 countries in G20, and offer opportunities to engage more deeply in global value chains and production networks. He suggested that businesses promote their strengths to increase competitiveness instead of depending on the Government’s support. He called on international groups and foreign firms to adopt more open supply policies as well as create more opportunities for Vietnamese businesses to join global value chains to a deeper extent. The Government is determined to maintain socio-political stability and macro-economic foundation, he said. “The Government is committed to stepping up structural reform and improving institutional quality and State governance at both central and local levels, in addition to reforming State businesses and the financial system, handling bad debts, and improving public debt management... It will work harder to unlock bottlenecks for faster and more sustainable growth,” he said. He added that the Government will accelerate its efforts to improve the business environment and increase national competitiveness. 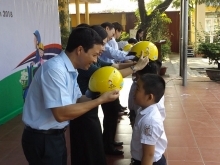 VBF serves as a dialogue mechanism between the Government of Vietnam and the national and international business communities to improve business conditions necessary to foster the development of private enterprises, facilitate the investment environment, and contribute to Vietnam’s sustainable economic growth.